Chorus Aviation has agreed with Bombardier for the purchase of nine CRJ900 aircraft for its Jazz airline operating under the Air Canada Express brand. 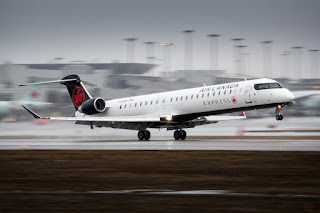 "The addition of these new CRJ900 aircraft is a significant step in modernising the Jazz fleet with larger aircraft while supporting the continued growth of our leasing revenue," said Joseph Randell, President and Chief Executive Officer, Chorus. "The economics of this aircraft will enhance our competitive position and our ability to more effectively respond to the needs of our customer and changing market demand." These nine 76-seat aircraft will be configured in two classes of service with 12 seats in business class and 64 seats in economy class, including 20 preferred economy seats. The aircraft will be fitted out with Bombardiers Atmosphere cabin and are scheduled for delivery from the first part of 2020.